Colgate palmolive, Joy, and Dawn are the most popular brands of dish liquid in the world. Nothing works better to get tough food and grease off of your cookware and dinnerware. Our pot and pan cleaners are economical for your restaurant to save you money and get the job done right. Most of our dish soaps are gentle on your hands as well. Colgate Palmolive Ultra Pots and Pans Dish Soap - 1 Gal. Procter and Gamble Dawn Manual Pot and Pan Detergent Lemon Scent 38 Oz. Procter and Gamble Dawn Manual Liquid Pot and Pan Detergent Regular Scent 38 Oz. Procter and Gamble Dawn Manual Pot and Pan Detergent Regular Scent 1.5 Oz. Procter and Gamble Joy Manual Pot and Pan Detergent Lemon Scent 38 Oz. Procter and Gamble Joy Refreshing Lemon Liquid Dish - 12.6 Oz. U.S.C. Enterprise Pink Pot and Pan Detergent Liquid - 1 Gal. Palmolive Original Green Dish Soap Liquid - 3 Oz. Palmolive Oxy For Pots and Pans Dishwash Liquid - 1 Gal. Dawn Manual Regular Scent Pot and Pan Detergent - 38 oz. Palmolive Eco Plus Lemon Dishwashing Detergent - 45 oz. Dawn Soap Dish Original - 12.6 Oz. Ivory Dish Soap Original - 24 fl.oz. Joy Refresh Lemon Dish Liquid - 30 oz. Microtech Manual Utensil Presoak Street - 1.5 Gal. Microtech Detergent Manual Pot and Pan - 1.5 Gal. Palmolive Condo Pack - 3 Oz. Palmolive Original Regular Dishwashing Liquid - 28 fl.oz. Ajax Triple Action Dish Liquid Orange - 52 Oz. Dawn Manual Pot and Pan Regular Scent Dish Soap - 1 Gal. Dawn Manual Pot and Pan Lemon Scent Dish Soap - 1 Gal. Ajax Original Dishwashing Liquid Regular - 28 Oz. Ajax Anti-Bacterial Dishwashing Liquid Regular - 28 Oz. Palmolive Professional Original Dishwashing Liquid - 1 Gal. Palmolive Professional Hand Dishwashing Liquid - 1 Gal. Palmolive Professional Hand Dishwashing Liquid - 5 Gal. Dawn Platinum Foam Dish Soap - 10.1 Oz. Palmolive Original Dishwashing Liquid Regular - 5 Gal. Dawn Ultra Liquid - 8 Fl. Oz. Dawn Ultra Liquid Orange - 8 Fl. Oz. Dawn Dishwasher Liquid - 8 Fl. Oz. Dish Soap Ultra Strength - 10 Fl. Oz. Palmolive Original Dish Liquid - 90 fl.oz. 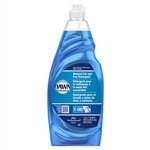 Dawn Ultra Original Dish Soap Liquid - 19.4 Fl. Oz. Dawn Ultra Antibacterial Hand Soap Dishwashing Liquid Orange - 19.4 Fl. Oz. Dawn Ultra Antibacterial Hand Soap Dishwashing Liquid Apple Blossom - 19.4 Fl. Oz. Dawn Ultra Original Scent Liquid - 28 Fl. Oz. Dawn Manual Pot and Pan Detergent Concentrate Original Scent - 5 Gal. Joy Manual Pot and Pan Detergent Lemon Scent Concentrate - 5 Gal. Dawn Manual Pot and Pan Detergent Lemon Scent Concentrate - 5 Gal. Palmolive Ultra Dishwashing Liquid - 20 Oz. Ajax Degreaser Lemon Dish Soap Liquid - 28 Oz. Palmolilve Orignal Dish Detergent - 12.6 Oz. Dawn Manual Pot and Pan Original Dish Soap - 1 Gal. Dawn Original Dish Detergent - 12.6 oz. 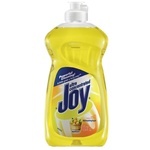 Joy Dishwashing Concentrated Liquid - 38 oz. 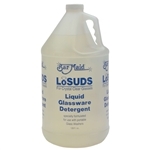 Wholesale commercial Dishwashing Liquid makes sure your restaurant dishes are super clean and spotless. Don't trust just any old dishwashing liquid in your restaurant or cafeteria.